It’s been a long, hard slog of a week. 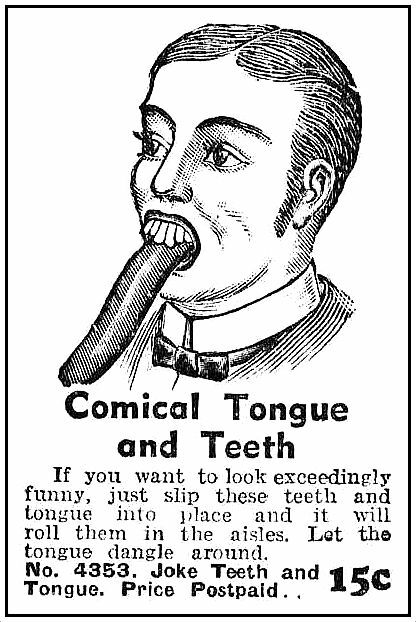 What we all need is comical teeth and a long rubber tongue to help relieve some of this stress. and it will roll them in the aisles. Let the tongue dangle around. I’ve got 15 cents burning a hole in my pocket, but I fear this ship has sailed. Come back, Joke Teeth and Tongue — the 21st century needs you. Bad. Found somewhere on El Internet. This entry was posted in Advertising, Art/Illustration and tagged tongues. Bookmark the permalink.